The machines are taking over in marketing. One of the big advantages of the big shift online is the sheer amount of data available to aid decisions – and the sheer amount of automation that can be done off the back of that data. The tools have never been more widely available, or affordable. As such, there’s no excuse for any business not to be engaged in marketing automation. Here’s why it’s time to love the robot. Chiefly, optimisation is about analytics. Online marketing offers an incredible treasure trove of data on which to base decisions. Website visits, social clicks – these are just the start. And they can do so much more than simply measure the outcome of a given piece of content or campaign. Used effectively, they can be used to test what works best. Different designs, different copy, different channels – a multichannel approach, even. A/B testing used to be a challenge to set up, but now multivariate testing is integrated into Google Analytics, it just requires a little set-up effort to get really valuable data that will inform your next campaign/content. Done on a continual basis, you can really laser in on what appeals to your audience. Ironically, the machination of marketing can actually make it more personal. And personalised marketing is increasingly expected – and effective. We practise this a lot with our GiraffeMail email marketing platform. Messages can be automatically triggered to go to users x minutes/hours/days/weeks after visiting a particular page on the site. The message can be tailored to exactly what they were looking at, following up on something they’ve already shown interest in. And the message can take exactly the right approach to sales for their position in the conversion funnel: softly softly if they’d only reached a top level page, or directly offering a discount on the product they were looking at to tip them into action. Particular actions – signing up for regular newsletters, for example – could even trigger a message to the sales department to give a personal phone call. We’ll admit it. Using automation does take a bit more effort, and a bit more investment up-front. So why do it? Because not only will your campaigns become more effective, but you’ll save significant amounts of capital along the way, which can free you up to make more strategic marketing decisions while the machines get on with the day to day. The crucial point is that everything we’ve described above – which is just the tip of the iceberg – can all just be set and left to run. Gather data for a month, tweak, gather more data, tweak again. Every pound spent will work more efficiently – as fewer pounds are wasted on tactics that don’t work as well as others – and fewer pounds need to be spent on maintenance rather than strategic investment. Not everything can be automated yet, but the machines are catching on. Social analytics are currently limited to easily quantifiable data like shares and likes. But that’s changing. Early attempts at sentiment analysis – machine evaluation of overall positivity and negativity of social reaction – have been fairly unimpressive and lacking in nuance. To really gauge reaction to content, products and campaigns you still need a human eye. But IBM’s Watson project gives us a glimpse of the future. Watson is IBM’s flagship AI, and he’s learning to interpret human emotion with a combination of Natural Language Processing (NLP) and machine learning. Simply put, he can understand human language, and is getting better at doing so by teaching himself. The repercussions are huge. If we can turn emotional responses – gathered primarily from social posts – into quantifiable data, we can segment our audience into groups based on their enthusiasm for our content and products, in order to deliver personalised messaging. Do androids dream of electric credit? The more we do this – connect with our customers’ emotions – the bigger the pay-off. A major American bank introduced a credit card targeted at Millennials, designed to inspire an emotional connection, and was rewarded with a 70% increase in usage and 40% new account growth. This campaign wasn’t the result of advanced sentiment analysis, but within a few years it easily could be. And with technology like this on the horizon, it only stands to reason to get good at using its precursors. Know how to segment your audience and automate tailored messages now, and you’ll be amongst the first to take advantage of AI in marketing when the technology becomes more accessible. 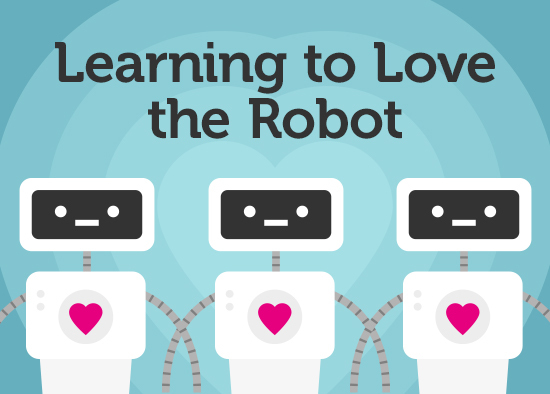 Robots are learning to love – well, to recognise love, at least. Isn’t it time you loved them back?